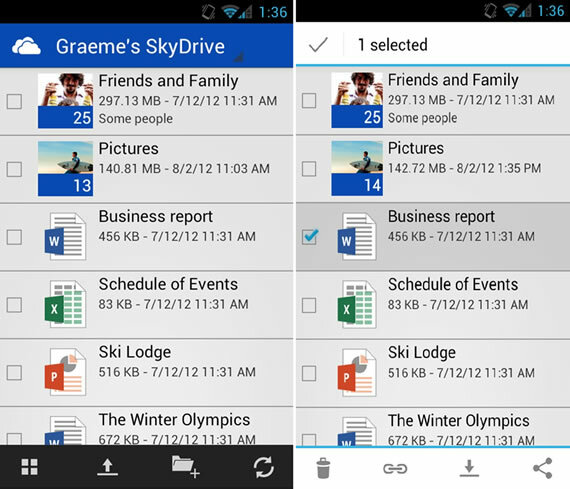 Microsoft has finally released SkyDrive app for Android devices, it is available for download from the Google Play Store. SkyDrive has apps for iOS and Windows Phone apart from PC and Mac desktop clients. Microsoft has promised earlier that they will release Android app soon and they delivered it today. Microsoft explains in a blog post the app design feels native for Android users, they designed the app making use of Android design patterns, while also keeping similar SkyDrive experience on all devices. SkyDrive app for Android is designed to work best with Android 4.0 IceCream Sandwich running devices, but it also works on Android 2.3 Gingerbread, currently the popular Android distribution. It won’t work on anything less than Android 2.3, that means Froyo devices are out of luck. SkyDrive offers 7GB of free storage, for it’s early adaptors it offers 25GB of free storage, it is a competitor to the likes of Dropbox and Google Drive. It is not as popular as Dropbox but it works well and now it has native clients on most platforms its usage should increase.